A specialist Cook would be usually be a man: in Old English the word for Cook is a male word. 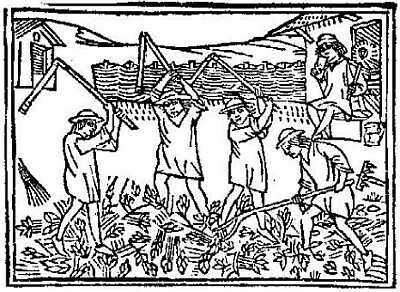 The cutting and gathering of wood was a summer occupation. Any crops would be growing and need little attention, but it was not yet harvest time. The villagers would take carts out into the nearby forests. 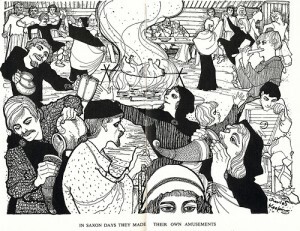 Peasants would often have a “right to gather” fallen branches in woods.Â Â Apart from their own needs fire wood bundles were often part of their Feorm or due they had to deliver to their Lord. Where it was naturally available coal might be used as fuel and charcoal was certainly produced, but fire wood was by far the most commonly consumed fuel. Most men and women would have their own set of fire steels, flints and tinder boxes. There are occasionally found in pagan graves. Dependant on what was easily available; the hearth was lined with clay tiles or stones and was heart of each house. Commonly this would be a fire pit in the centre of the room. Smoke would escape through a hole in the roof or just be filtrating out through the thatch. Sometimes heated stones were dropped in pots of water to boil it as a prelude to boiling food. Larger brick ovens would often have been located in separate buildings and burnt wood faggots.Â Sometimes they would consist of a chamber for fire with flues to carry hot air to another chamber where the food was cooked. Pots and Cauldrons could be made from metals such as Iron, Bronze, Copper or Tin. Clay pots were used but soapstone was popular as it was tough and easier to clean than other crockery. 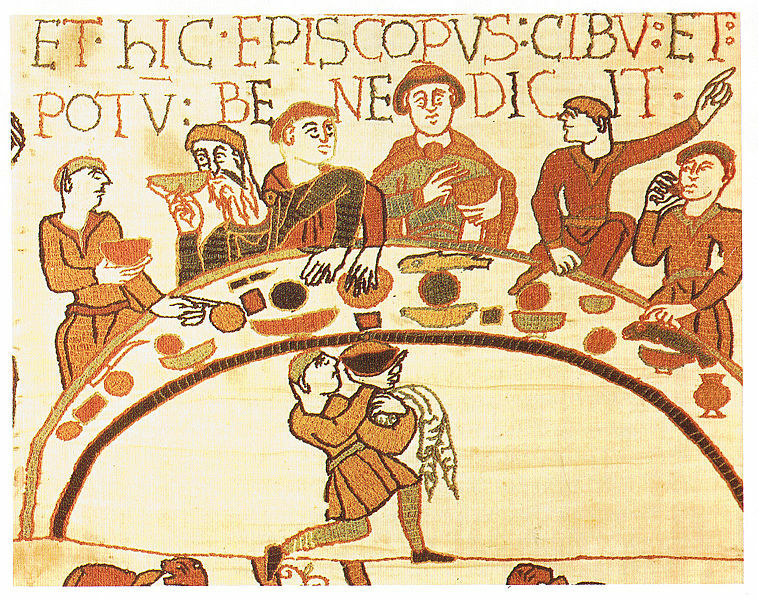 Boiling and stewing was main method used by the Anglo Saxons. Often salted meat was later boiled. e.g. Goose put in floured bag with milk or butter and lowered into cauldron. Beans, barley and vegetables might be in other bags in the same cauldron. Griddles and frying pans were in use e.g for cooking flat breads or omelettes. For unleavened bread, flat bread and round cakes this was prepared by mixing meal (ground barley, wheat etc) with salt. 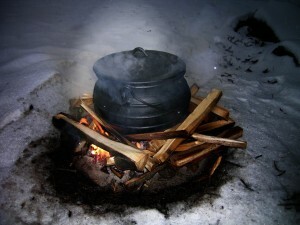 This would then be cooked on a griddle or upon the hot heath stones near the fire. Adding yeast produced leavened bread. Yeast could obtained from the dregs that remained after brewing ale â€“ or even some forms of mould. Bread was cooked in a pan, upon hearth stones or in the oven. Ovens could be single chambers or two chambers. In the single chamber you put in wooden faggots and burnt them. When the faggots where ash you would take out the ash and put in the dough. This bread would be blackened and discoloured so you would have to cut or break off the crust. Alternatively, you could cover the bread with an upturned pot and then pile the hot embers ash on top. Another method was the two chamber oven. Wood would be burnt in one chamber and the bread cooked in the adjacent chamber, which was heated by hot air from the other. 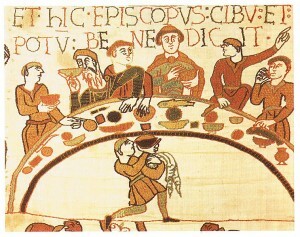 Milk, butter and cheese represented a significant part of the Anglo Saxon diet. They were also used as payments and dues: making up part of the Feorm handed over to a lord or King. Milk was frequently an ingredient in medicines as the basis for drinks, whilst butter was occasionally used to make oily poultices and cheese consumed to treat asthma. What is clear from this is that not only did milk get used from all these animals, but also just how tightly the Saxon’s lives were regulated by reference to rules laid down by Kings and others and to the dates and calendars of the year. The animals were typically looked after in the fields by men who often milked their beasts. Even in the modern era we struggle to keep milk from going sour, especially in the warm summer months. Over a thousand years ago they had no refrigeration and the problem of sour milk was very pertinent. Indeed, such trouble did it cause, that St Columba once rebuked a follower for not casting out the devil at the bottom of the milking pail! Making butter and cheese was usually done by the womenfolk. Indeed some charters and codes of law specify the payments these women had to make to sell their products at the markets around Christmas: e.g. a penny. This suggested it was common place for these women to be selling the cheeses at market. The Saxons did not usually drink cream. Instead this became the basis of butter. The rest of the milk would be separated from the cream and the cream churned to make butter. Butter was usually salted for, as with all dairy products its life was short, so this helped to preserve it. This was accomplished but mixing the salt through the butter then pressing it down between layers of salt in a barrel to keep air away. The Saxons were quite advanced at the production of cheeses. Walk milk would be curdled to make junket which was then cut up. The lumps of curds would make the cheese. The liquid whey was sometimes used for more butter. The Saxons relied on different methods to curdle milk. Firstly, as they used wooden utensils which were not sterilised, the build up of bacteria upon them would assist this process. They also had access to a natural curdling agent still used today: rennet. This is produced in the stomachs of mammals e.g. 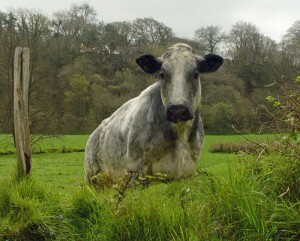 cows. It is also present in certain plants such as thistles and safflower. Vinegar could also be used to help curdle milk. Fresh cheeses were usually eaten by the poor, whereas mature cheeses, which needed more careful preservation, fetched a higher price making them mostly consumed by the wealthier members of society. Although blue cheeses are mentioned in French records there is little evidence for them being made in quantity by the Anglo-Saxons. As with many references I make to Food and Drink I am reliant primarily on the excellent books by Ann Hagen Â and published by Anglo Saxon Books. 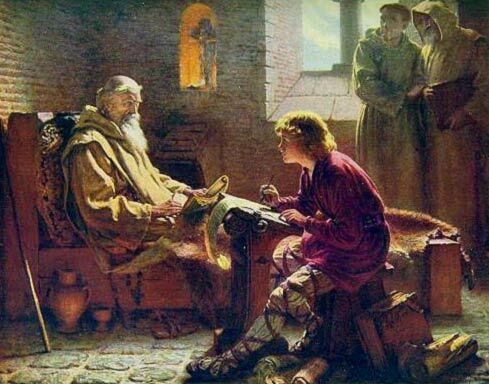 This article is one of a series of articles looking at life in Anglo Saxon times: An Anglo Saxon Survival Guide, if you like. Â In writingÂ The Amber Treasure I have tried to remain faithful to the historical facts. More on Food and Drink next week. I am the author of Â The Amber Treasure:Â TreacheryÂ in Dark Age Northumbria.